Dental 3D printing is an additive manufacturing process of creating a three dimensional solid dental models such as implants, surgical guides, braces, dentures, crowns and bridges etc. Dental 3D printing is performed by additive process where 3D models are created by laying down sequential layers of material which is programmed by digital file. The demand for 3D printing in dental industry has been increased due advancement in technology which enables the dentist to perform the dental procedure with great accuracy, high efficiency and minimal trauma to the patients. According to the research report, the global dental 3D printing market is expected to be worth US$3,427.1 mn by the end of 2025 from US$903.0 mn in 2016. During the forecast years of 2017 and 2025, the global market is estimated to register a CAGR of 16.5%. Based on material, dental 3D printing market is segmented into metal, photopolymer, ceramic and others. The photopolymer segment accounts for largest market for dental 3D printing with market share of 58.0% in 2016 due to advent in new technology for development of cost effective photopolymer material. The ability of photopolymer to be compatible for construction of wide variety of dental models is expected to be its unique selling point over the forecast period. The metal segment is projected to grow at moderate rate in forecast period due to rising cost of metal based printers owing to high processing cost of metal into powdered form before it could be used in printers. Dental 3D printing is extensively used for making dental implants, dentures, crowns and bridges and others. The crowns and bridges segment leads the pack as it accounted for a share of 34.2% in the global market in 2016. This segment is estimated to dominate the overall market due to rising prevalence of dental caries and increase in incidence of tooth loss owing to injury and accident. The dental implants and dentures segment is anticipated to grow at significant rate during forecast period due to rise in aging population worldwide and rising demand for cosmetic dentistry to enhance the quality of life. From a geographic point of view, the global dental 3D printing market is categorized into regions such as North America, Asia Pacific, Europe, the Middle East and Africa, and Latin America. Out of these, the North America dental 3D printing market held a leading share in the global market in 2016, accounting for nearly 40.0% of the market. The region is expected to retain its position in the coming years due to advent of novel technology and increasing demand for cosmetic dentistry, insurance coverage for dental healthcare, and rising popularity of digital dentistry among dentist. On the other hand, Asia Pacific is projected to register the highest growth rate over the forecast period owing to increase in prevalence of dental caries and dental related problems in developing countries, rise in aging population and set up of new distribution channels by key players in emerging market of Asia Pacific. The competitive landscape in the global dental 3D printing market is observed to be highly consolidated. Stratasys Ltd dominated the global dental 3D printing market in 2016 with its strong product portfolio and widespread market presence and consistent technological development. The other major players in the dental 3D printing market are Concept Laser GmbH 3D Systems, Inc., EnvisionTEC, Inc., Formlabs, Inc., Renishaw plc., DWS System, Prodways Group, Asiga, SLM Solutions and others. The report on the dental 3D printing market analyzes the current and future scenario of the global market. Increase in prevalence of dental caries and tooth loss, advent of new technology for development of low cost dental 3D printers, and increase in preference for digital dentistry over traditional method by dental technicians and physicians, are the major drivers of the global dental 3D printing market. The dental 3D printing market report comprises an elaborate executive summary, which includes a market snapshot that provides information about various segments of the market. It also provides information and data analysis of the global dental 3D printing market with respect to the segments based on technology, material, application and geography. A detailed qualitative analysis of drivers and restraints of the market and opportunities has been provided in the market overview section. In addition, the section comprises porters five forces analysis to understand the competitive landscape in the market. This section of the report also provides market attractiveness analysis, by geography and market share analysis by key players, thus presenting a thorough analysis of the overall competitive scenario in the global dental 3D printing market. 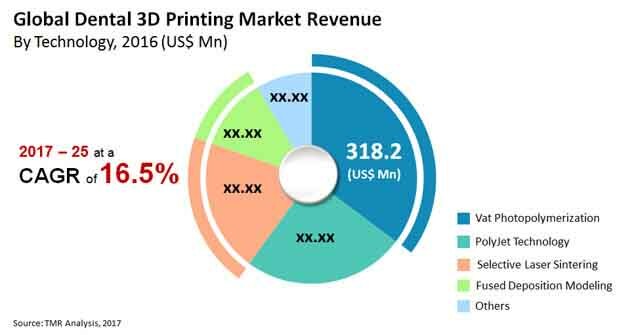 Based on technology, the dental 3D printing market is segmented as vat photopolymerization, fused deposition modeling (FDM), polyJet technology, selective laser sintering (SLS), and others. The vat photopolymerization is further segmented into stereolithography (SLA) and digital light processing (DLP).The technology market segments have been analyzed based on available approved technology and products, cost-effectiveness, and preference for technology by dental physicians. The market size and forecast for each of these segments have been provided for the period from 2015 to 2025, along with their respective CAGRs for the forecast period from 2017 to 2025, considering 2016 as the base year. Based on material, dental 3D printing market is segmented into metal, photopolymer, ceramic and others. Based on application, dental 3D printing market is segmented into dental implants, dentures, crowns & bridges, and others. The market segments have been extensively analyzed based on demand for dental care, available treatment, and geographical coverage. The market size and forecast in terms of US$ Mn for each segment have been provided for the period from 2015 to 2025. The report also provides the compound annual growth rate (CAGR %) for each market segment for the forecast period from 2017 to 2025, considering 2016 as the base year. Geographically, the global dental 3D printing market has been categorized into five major regions and the key countries in the respective region: North America (the U.S., Canada), Europe (the U.K., Germany, Russia, France, Spain, Italy, and Rest of Europe), Asia Pacific (Japan, India, China, Australia & New Zealand and Rest of Asia Pacific), Latin America (Brazil, Mexico, and Rest of Latin America) and Middle East & Africa (South Africa, GCC countries and Rest of Middle East & Africa). The market size and forecast for each of these regions and the mentioned countries have been provided for the period from 2015 to 2025, along with their respective CAGRs for the forecast period from 2017 to 2025, considering 2016 as the base year. The research study also covers the competitive scenario in these regions.